"Padua, nursery of arts... Lombardy, the pleasant garden of great Italy"
Padua was famous as a center of learning, and the Lombardy region was known for its agricultural productivity. Tranio, since I really wanted to see beautiful Padua, famous for being a city of learning, now I’m here at fruitful Lombardy: the pleasant garden of great Italy. And since I have my father’s love and permission, I’ve got both his good will and your good company. You’re my trusty servant, reliable in every way. Now that we’re here, let’s stay and maybe start a course of learning and intellectual studies. I was born in Pisa, renowned for its dignified citizens. And so was my father before me: Vincentino, a merchant who trades all around the world. We’re descended from the Bentivolii. My trusty servant well approved in all. It only makes sense for me, Vincentio’s son raised in Florence, to fulfill my father’s expectations. I have to decorate my good fortune with virtuous deeds. Therefore, Tranio, while I’m here, I’ll apply myself to studying virtue and the philosophy of the happiness that virtue brings. Tell me what you think: for I’ve left Pisa and come to Padua, like someone who jumps out of a shallow puddle and into a lake, hoping to quench his thirst with excess. Tranio thinks Lucentio is going a bit overboard in advocating a philosophy of strict virtue and moral discipline. Tranio thinks they shouldn’t become followers of Stoicism, which taught that one should minimize the desire of pleasure, or of Aristotle who valued contemplation more than the sensual pleasures. People like that would even have denounced the Roman writer Ovid, author of The Art of Love. Pardon me, my gentle master, I feel the same way as you. I’m glad that you continue in your decision to taste the sweet taste of philosophy. But although, good master, I admire the virtue and morality you mentioned, let’s not be stoic or emotionless, please, nor so devoted to Aristotle’s self-restraint that we reject Ovid’s love poetry altogether. Pursue your logic among friends, and practice your fancy speech in casual conversation. But use music and poetry to excite you! Turn to math and philosophy as much as you can stomach them, but there’s no point if you don’t enjoy it. In short, sir, study what you like the most. As Ovid be an outcast, quite abjured. But stay a while, what company is this? Thanks, Tranio. You give good advice. If only Biondello would arrive, we could prepare ourselves right away. We have to find a place to stay where we can entertain the friends we’ll make in Padua. But wait a minute...who are these people? Master, it’s a spectacle to welcome us to town. Gentlemen, stop pestering me! You know I’m firmly resolved not to give my younger daughter in marriage before I’ve found a husband for the older one. If either of you love Katherina, since I know and love you both, I’ll let you court her as much as you want. [Aside] To “cart” her rather; she's too rough for me. Women criminals — mostly prostitutes — were sometimes punished by being driven through the streets in a cart while being whipped. [Aloud] There, there, Hortensio, will you any wife? Katherina is being made a stale (a laughingstock) in front of these two mates (contemptible men). Katherina is being made a stale (decoy) for Bianca so that Bianca can get a mate (husband). Katherina has placed Gremio and Hortensio in a “stalemate,” a deadlock where neither can prevail over his rival in the pursuit of Bianca. Iwis, it is not halfway to her heart. [Aside] I’d rather cart her than court her. She’s too harsh for me. [Aloud to Hortensio] What about you, Hortensio? Do you want a wife? Let me ask you, sir, are you trying to make a fool out of me with all these suitors? Husband? What do you mean? No one would be your husband, unless you behaved more gently and mildly. I swear, sir, you have no need to fear. Marriage isn’t even close to what I want. But if it were, have no doubt that I’d hit your head with a three-legged stool, making your face bloody, and treat you like a fool. Oh Lord! Save us from devils like her! Save me too, good Lord! [Aside to Lucentio] Shh, master! Watch this, it’s gonna be good: that girl’s either completely crazy, or incredibly stubborn. [Aside to Tranio] But her sister is silent, behaving like a modest and sensible maiden. Now hush, Tranio! [Aside to Lucentio] Good point, master. Let’s be quiet and watch. [Quietly to Lucentio] Hush, master! Here's some good pastime toward. That wench is stark mad, or wonderful froward. Well said, master. Mum, and gaze your fill. To "put a finger in the eye" was proverbial phrase meaning to play the victim. Katherina is sarcastically suggesting that Bianca could gain more sympathy by putting a finger in her eye to create some fake tears. Put finger in the eye, and she knew why. Gentlemen, I’d like to make good on what I’ve said — Bianca, go inside. And don’t be upset, Bianca, I’ll love you no matter what. Spoiled brat! I bet she’d make herself cry, if she thought of a reason. Sister, just be glad I’m unhappy — Father, I’ll humbly do what you say. My books and music will keep me company. I’ll read and practice my instruments. [aside to Tranio] Listen, Tranio! She sounds like Minerva herself! Signor Baptista, why are you so against us? I’m sorry our good intentions upset Bianca. Sir, to your pleasure, humbly I subscribe. On them to look and practice by myself. [Quietly to Tranio] Hark, Tranio! Thou mayst hear Minerva speak. Minerva was the goddess of wisdom and inventor of the flute, so Lucentio is paying Bianca a very big compliment. Signor Baptista, will you be so strange? Gentlemen, content ye; I am resolved. Why lock her up just because of her crazy sister, Signor Baptista? Why punish her for something she didn’t do? Give up, gentlemen, I’ve made my choice. Go inside, Bianca. And since I know Bianca loves music and poetry, I’ll keep teachers around the house who can instruct her. If either of you, Hortensio and Gremio, know any teachers like that, introduce them to me. I’ll pay them very well if they’re intelligent. I’m generous when it comes to my children’s education. Goodbye — Katherina, you can stay here. I have something to discuss with Bianca. To mine own children in good bringing-up. what to take and what to leave? Ha! To fast means to go without food. Gremio’s saying that women’s love is not so important that he and Hortensio can’t just go without it until the problem of Katherina gets resolved. He follows up the “fasting” metaphor with a food proverb. “My cake is dough” means your project has failed (your cake didn’t bake). Their cake is dough “on both sides” — that is, neither one of them has succeeded in being able in woo Bianca. and fast it fairly out. Our cake's dough on both sides. I can stay? Then I guess I can go too, right? Am I going to be told where to be every hour, as if I can’t take care of myself? [To Katherina, as if she’s still there] You can go, all right — to hell! The way you are, nobody can restrain you. [To Hortensio] Women’s love isn’t so important that we can’t wait a while, Hortensio. We’ll get through this. For now, we’ve both lost. Goodbye. But out of love for sweet Bianca, if I can find a teacher who’ll make her happy, I’ll send him to her father. So will I, Gremio. But wait, listen to me. We’ve never teamed up before, because of our rivalry, but now we have a common goal. If we want to court Bianca again and be rivals like we were before, we need to accomplish one thing. We need to find a husband for her sister. A husband? You mean a devil. she delights, I will wish him to her father. So will I, Signior Gremio; but a word, I pray. would take her with all faults — and money enough. Well I say a devil. Do you think anyone’s stupid enough to marry that demon — even with all her father’s money? Oh, come on, Gremio! Even though you and I find her loud squabbling annoying, don’t you think we could find a man good enough to accept all her faults? Especially if her father offers a large dowry. I don’t know about that. I’d rather be whipped in the marketplace every morning than marry her — even with a large dowry. You’re right, those are both terrible options. But come on! Our situation has put us on the same team. It’s good for everyone if we find Baptista’s older daughter a husband. Then Bianca will be free to be married, and we can be rivals all over again. Sweet Bianca! May the best man win. I’ll race you to her. What do you say, Gremio? Okay, I’m in. Whatever man can woo Katherina, marry her, sleep with her and get rid of her — I wish he had the fastest horse in Padua! Let’s go. To say that there’s little choice between rotten apples was proverbial. Hortensio is saying that there’s little difference between two equally bad options — in this case, marrying Katherina or being whipped in the marketplace. Baptista’s legal control of his daughters is “barring” them from making Baptista their father-in-law. Here, this proverb has a metaphorical meaning. In one of the events at a jousting tournament, the riders would race through a course, spearing rings with their lances. In their battle for Bianca, the fastest of the two suitors will get to marry her. Gremio continues the horse metaphor in the following passage. the ring. How say you, Signior Gremio? the house of her! Come on. That love should, of a sudden, take such hold? Lucentio fell in love with Bianca while he was idly looking on. But idleness is another name for a pansy, the garden flower. According to folklore, placing idleness on the eyelids of someone who’s asleep caused him or her to fall in love with the first person they see upon awakening. I found the effect of love in idleness. According to ancient Greek mythology, after the Greeks defeated the Trojans in the Trojan war, the Trojan nobleman Aeneas made his way to Carthage in north Africa. There, Queen Dido fell in love him. The first person to whom the queen revealed her love was her sister, Anna. Sadly, in the end, Aeneas abandoned Queen Dido, and she threw herself on a burning funeral pyre. Let’s hope Lucentio’s relationship with Bianca has a more pleasant ending. Sir, tell me: is it possible to fall in love so quickly? Oh Tranio, I didn’t think it was possible either until it happened to me. But while I just stood here watching, love took hold of me. And now I must confess — I’ll confide in you like Dido did to her sister Anna — Oh Tranio, I’m burning, missing her… I’ll die if I can’t be with this girl, Tranio! What should I do, Tranio? I know you give good advice. Help me, Tranio, I know you will. Master, this is no time to lecture you. Love can’t just be scolded out of the heart. If this is really love, I have nothing to say but this from the Latin: Ransom yourself as cheaply as you can. Thanks, that helps. Go on, it’s comforting to hear what you have to say. Master, you stared at that girl for so long that you might not have noticed the essence of the situation. If love have touched you, naught remains but so. This is a phrase from a Latin textbook that many in Shakespeare’s audience would have recognized from their school days. It translates as “Regain your freedom at the lowest price.” In other words, Tranio thinks his master should get out of this situation — being hopelessly love with Bianca — in the easiest way possible. Tranio is very well educated for a servant, but apparently he’s not the world's biggest romantic. Gramercies, lad. Go forward, this contents. The rest will comfort for thy counsel's sound. Perhaps you marked not what's the pith of all. According to ancient mythology, Jove, king of the gods, fell in love with the daughter of King Agenor. He kidnapped her by turning himself into a tame white bull and mixing with her father’s herd. When she climbed on his back, he plunged into the sea and carried her off to the island of Crete. Lucentio’s version is a bit more romantic. Upon reaching Crete, Jove “kisses” the sand with his knees (kneels), and then kisses her hand. When, with his knees, he kissed the Cretan strand. Although it has almost completely disappeared in modern times, in Shakespeare’s day, a beautiful red coral grew in the Mediterranean Sea, which was prized almost as much as a precious stone. [Aside] Nay, then, 'tis time to stir him from his trance. Oh yes, I saw the sweet beauty of her face! As beautiful as Agenor’s daughter Europa, when the great god Jupiter pursued her, kneeling on the sand of Crete. Sure, but didn’t you see anything else? Didn’t you notice her sister yelling and shouting, louder than human ears can stand? Tranio, I saw Bianca’s pink lips move, and her breath like perfume. I saw her sacredness and her sweetness. [Aside] Well then, I guess I’ll have to snap him out of this trance. —Wake up, sir! If you love her, you’re going to have to be clever about pursuing her. Here’s the deal: her older sister is such a foul, grumpy woman that, until her father marries her off, he won’t let Bianca get married. She’s living at home as a maiden. He’s locked her up to keep the men away. Originally, “shrew” referred to the small burrowing animal with very sharp teeth. The animal’s name derived from the German “skreu-”, to cut. Because shrews are ferocious and their bite is poisonous, it was believed that they were possessed by an evil spirit. So when the word was first applied to people, it referred to an evil person, a devil. By Shakespeare’s time though, the meaning had mellowed and narrowed. It referred specifically to a scolding, ill-tempered woman. A woman behaving in this manner was described as shrewd. 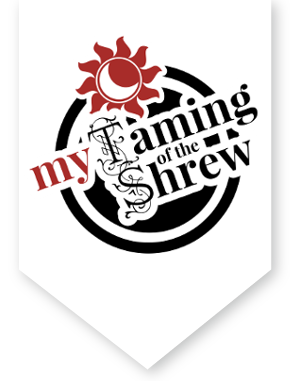 Today, the noun, shrew, is rarely heard, but when it is, it has the same meaning as in Shakespeare’s day. However the adjective, shrewd, has taken on a very different sense. In the very early times when “shrew” still referred to a devilish person, to be shrewd meant to be very cunning at performing evil deeds. Ironically, today it’s generally used in a positive sense, to describe someone who’s very savvy or clever. Because she will not be annoyed with suitors. And undertake the teaching of the maid. Oh Tranio, he’s such a cruel father. But didn’t you hear, he’s trying to find clever tutors to teach her? Indeed, I heard, sir. And I have a plan. I have one too, Tranio. Master, I bet we had the same idea. You’ll be the tutor who teaches the girl. Was that your plan? Indeed it was. Do you think it’s possible? I don’t think so. If you play the teacher, who’ll play you — Vincentio’s son visiting Padua? Who’ll keep your house, read your books, welcome your friends, visit and dine with your countrymen? Enough! Relax, I’ve got it all figured out. Nobody has seen us yet, and they won’t know which one of us is the servant and which one is the master. So, Tranio: you’ll be my master instead of me. Run the house and the servants just like I would. I’ll be someone else, maybe from Florence or Naples, or just a regular man from Pisa. That’s how the plan is going to work. Tranio, take off your clothes and put on my more colorful hat and cloak. When Biondello comes, he’ll serve you. But first I’ll make sure he keeps our secret. Uncase thee; take my coloured hat and cloak. “To charm the tongue” was proverbial and meant to keep someone spilling the beans. Whatever you need. Since this is what you want, I’ll do it. It’s my job, after all. Your father told me to serve you well—although I don’t think this was what he meant. In any case, I’m happy to be Lucentio, since I like him so much. Yes Tranio, do that; I like you too. I’d be willing to be a slave to get the girl, the very sight of whom has enslaved me. Whose sudden sight hath thralled my wounded eye. According to myth, anyone hit by one of Cupid’s arrows immediately falls in love. Since Lucentio fell in love just by the sight of Bianca, he must have been struck in his eye by Cupid’s arrow. Here comes the rogue. [To Biondello] Sirrah, where have you been? Here he comes, the lazy bum. Where have you been? Where have I been? I could ask you the same thing! Did Tranio steal your clothes, or did you steal his? Or both? What’s going on? Come here. This is no time to joke, so adjust your attitude to the situation. Your fellow servant Tranio is dressed up as me, to save my life. And I’m dressed up as him to escape. When I got here, I killed a man in a fight, and I’m afraid I might have been recognized. Now I’m asking you to act like his servant, while I get out of here to save my life. Do you understand? Who, me? No, not at all. And don’t ever call him Tranio! He’s Lucentio now. And I, for my escape, have put on his. I kill'd a man and fear I was descried. And not a jot of Tranio in your mouth. The better for him. Would I were so too! Good for him. I wish I were Lucentio, too. Trust me, I’d wish that too, if it meant Lucentio could have Baptista’s youngest daughter. For your master’s sake, not mine, be careful in different groups of people. When we’re alone, you can call me Tranio. But everywhere else, pretend I’m your master Lucentio. Let’s go, Tranio. There’s one more thing you have to do: become one of these men pursuing Bianca. If you want to know why, just trust me. I have my reasons. You’re nodding off, my lord. You’re not watching the play. Yes I am, by Saint Anne! It’s a good plot, of course. Is it over yet? My lord, that was only the beginning. It’s an excellent piece of work, madam lady: but I wish it were done! My lord, you nod, you do not mind the play. Yes, by Saint Anne, do I. A good matter, surely. [As a Lady] My lord, 'tis but begun.